Here is an improvised recording I made a little while ago. On that morning, a mermaid swam up from my depths to speak. And sing … if you’re willing to wait for it! Wow, very powerful story. The last lines about finding hope at the bottom of the treasure box because the meaning is there is intriguing. I felt myself swimming down there, looking for the meaning with focused attention. But interestingly, in my scenario, as I opened the box and started digging through what was there, it all floated up, suspended in the sea around me in all directions. But rather than just all floating away, I saw myself in the centre surrounded by these things floating, with space between them and light. I felt a sense of lightness and warmth in my heart. My mind at first tried to find meaning, but instead had to just observe the beauty of the scene and the compassionate release that I felt. 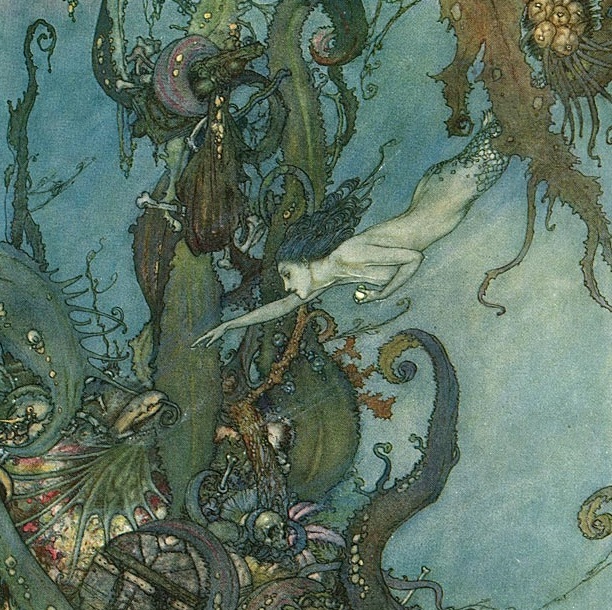 Thanks for swimming down into the depths and inviting your fellow mermaids to play. Thank you, dear Kathy, for sharing your own deep sea experience. We don’t often get to hear from the mermaids!